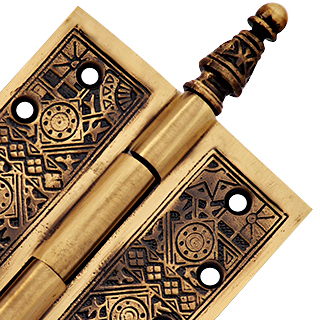 3 1/2 x 3 1/2 Inch Victorian Steeple Tip Style Hinge (Antique Brass Finish) - measures 3 1/2 by 3 1/2 inch (not including the steeples). Mounts with four screws (included). Measurements with steeples is approximately 6 1/2 inch by 3 1/2 inch. Sold in pairs.